Released in America and England during 1966, Sergio Leone’s first entry in his “Dollars” trilogy appeared with the advertising tag-line, “This is the first film of its kind. It won’t be the last.” The words heralded the advent of the Italian Western, which would briefly but significantly revitalise a declining genre; the future work of Sam Peckinpah – most notably, The Wild Bunch (1969) – and Clint Eastwood’s first Western as director, High Plains Drifter (1973), were two beneficiaries of this moviement. As well as the American legacy he borrowed from, Leone’s apprentice work was indebted to a master text, Kurosawa Akira’s Yojimbo (1961). In Kurosawa’s film, Sanjuro is an unemployed samurai in the Tokugawa era suffering displacement due to his country’s modernist development. He accidentally stumbles on rival clans in a remote village and takes pleasure in destroying them both. The only disturbing evidence of modernity is the pistol displayed by villainous Unosuke (Tatsuya Nakadai, who would later appear in a Italian Western, Today It’s Me… Tomorrow You [Dario Argento & Tonino Cervi, 1968] playing a Mexican bandit) but it is easily rendered impotent by Sanjuro’s knife-throwing prowess. As well as having stylistic differences from Yojimbo, A Fistful of Dollars places modernity at the center of its text emphasizing economic acquisition and firepower, whether through pistols, Winchesters, gatling-guns, or dynamite. Unlike in Yojimbo, classical heroic values are no longer of any use – a point made symbolically when Ramon uses Conquistador armour for target practice. A Fistful of Dollars followed the standard procedure in Italian Westerns of casting an American actor in the lead (usually either an unknown such as Richard Harrison or Jim Mitchum, a B-Western actor like Rod Cameron and Alex Nicol, or a former star who had seen better days such as Joseph Cotton). Leone originally attempted to obtain Henry Fonda for the role of “No Name”. He finally obtained Clint Eastwood after James Coburn and another exiled American actor, Richard Harrison, refused the role. Formerly known as Rowdy Yates in the long-running American television series Rawhide, willingly took on the challenges of his new role (not the least of which was the danger of permanent exile in the Italian film industry). Although European Westerns had been around since the beginning of the silent era, recent German and Italian examples were strongly influenced either by their American counterparts or 19th century German writer Karl May who never went west of the Rhine in his Fenimore Cooper-influenced stories of Winnetou the Warrior and Old Shatterhand (often played by American actors such as Lex Barker). The Italian film industry also attempted to escape from these influences but the makers of films such as Massacre at Grand Canyon (Albert Band & Sergio Corbucci, 1963), Gunfight at Red Sands (Ricardo Blasco,1963), Bullets Don’t Argue (Mario Caiano, 1964) and Minnesota Clay (Sergio Corbucci, 1965) featuring American actors such as Jim Mitchum, Richard Harrison, Rod Cameron and Cameron Mitchell, tended to follow the Hollywood model. One exception was composer Ennio Morricone whose scores for Bullets Don’t Argue and Massacre at Red Sands gave the musical theme an equal prominence in the film. 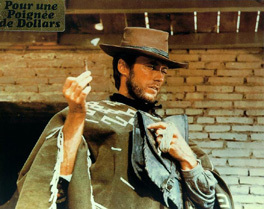 When Morricone collaborated with Leone on A Fistful of Dollars, he initiated one of the key aspects of the Italian Western – an operatic score heavily marking the genre as the “opera of violence”. In cinema of this period, perhaps only the collaboration of Alfred Hitchcock and Bernard Herrmann gave a comparably dominant place to the film score – a particularly appropriate development for a country associated with the grand opera of Verdi and others. (Puccini had written a western opera for the stage way back in 1910, The Girl of the Golden West.) Featuring the trumpet (perhaps indebted to Dimitri Tiomkin’s “Deguello” theme in Hawks’ 1959 Western Rio Bravo), Ennio Morricone developed the conventions of the Western score in new directions, most notably in the final gundown between hero and villain in a “corrida” setting, emphasising both suspense and violence. Furthermore, the whistling “leitmotif” associated with Eastwood was another of the conventions of grand opera that Morricone, along with other composers such as Gianni Ferrio, Bruno Nicolai, and Francesco Lavagnino, would later develop. Ironically, the producers of A Fistful of Dollars felt so insecure about the final product that they first attempted to pass it off as an American low-budget western by changing the names. Eastwood remained the same. But Gian Maria Volonté became Johnny Wels while veteran German actor Wolfgang Lukschy was now W. Lukschy. Director of photography Massimo Dallamano became Jack Dalmas, Morricone was now Dan Savio, and Leone (who wrote the screenplay with Duccio Tessari) became Bob Robertson. Nevertheless, the film became an overnight success in Rome. Following two years of careful publicity, it was acclaimed by American and British audiences but not by critics who regarded it as a violation of their cherished Hollywood formula. However, most critics changed their minds some twenty years later.